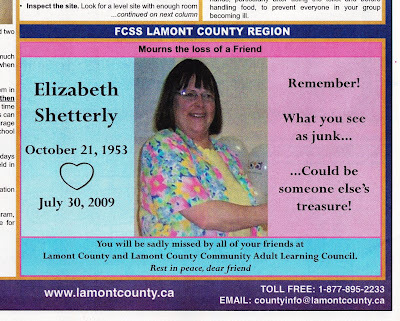 It may've seemed like a strange way to remember someone, but Liz would've approved. This is the perfect time to call for a new progressive tax schemes on the super-rich. In fact, if we had in place a fair system, there would be no deficit problem at all. Consider the fact that by 2008, the top 400 billionaires in the U.S. averaged $3.4 billion in assets each! Their total net worth was a whopping $1.56 trillion. That capital accumulated because, as a matter of policy, we encouraged income and wealth to concentrate at the very top of the income ladder. If we had kept in place the Eisenhower era tax system, the deficit Buffett worries so much about would nearly vanish. The birthday's wrong—she was just over a year younger than me—but that's not what matters. It was very kind of the folks who made it, and kind of Scott to send me a copy. Thanks, all! Apologies to anyone I alarmed with the mention of her surgery. She was having some scheduled retina maintenance. All is well. AHCCCS, Arizona's version of Medicaid, is a wonderful program; it's one of the reasons I support Medicare For All. 2. "Women's councils are strong." — Chief Connie Gray-McKay of Mishkeegogamang First Nation. Connie, who lived with my family when they ran a trading post at Rat Rapids, Ontario, and who says she has two mothers, her natural mother and my mom, and one father, my dad, because she didn't know her natural father, was a great help. I told her I wanted to talk to Dad alone, but if I failed, the women should take over. That's when Connie made her observation. She was a very capable teenager when she lived with us; it's no wonder that she's become the chief now. The talk with Dad went well. But I did warn him the women were ready to come in if necessary, and that didn't hurt the outcome. 1. The chief of Mishkeegogamang First Nation drove about 25 hours from northern Ontario with her mother, a good friend, and the friend's daughter to be at the memorial. 2. Two more friends drove about as far from the Northwest Territories. 3. My brother and his family drove about two thousand miles from southern New Mexico. 5. I conducted the memorial service. It was meant as a gift to my mother, but I regret it a tiny bit: I was a little less present than I would've liked because I had to focus on how everyone else was doing. My day for grieving was the day after. I wish we had recordings of what everyone said. The friends who drove great distances were especially poignant, but perhaps the most touching comments were from three children from different families who I had not known, friends of Liz's from the area. Their parents said they had not expected the kids to say anything, but hearing the adults speak, one girl decided to speak, and then another boy and girl did also. It's good to know my sister was loved so very much. Just got home a couple of hours ago. Exhausted. I may do a long blog report about the trip at some time, but there are changes I'm making in my life now, and one of them is to spend less time online. This is not a club very many people want to join. While I've appreciated comments from everyone, in some ways, hearing from people who have lost siblings is especially touching. Then my gut reaction isn't along the lines of "Thanks for the sympathy." It's more like, "Oh, man, I'm sorry!" The love of speech codes. Being polite is nice. Signing a speech code is troubling, no matter how well-intended the speech code may be. I try to think of the people who couldn't talk if they signed speech codes, and the quick answer is any comedian who followed Lenny Bruce, George Carlin, and Richard Pryor. The proper progression for free speech is more freedom, no matter how offensive you may find it. The fact that something offends people is the proof that offensive language communicates powerfully. Moreover, for all that irony and parody are often missed by people who read quickly, they are necessary parts of any good writer's bag of tricks. If you don't know what prompted this, I envy you. P.S. For people who don't know that "NWA" is a compliment for anyone who's not bourgeois: the original N.W.A. The family and friends will gather next week. We're still working out details, changing Emma's ticket so she can meet me in Edmonton, weighing the merits of me driving up or both of us flying for the whole trip, etc. Many phone calls have been made. It's odd how funerals are too often the times we see people we love. I must tell a relative to get married. Actually, among the coincidences: my nephew Brian got married without telling anyone on the morning Liz died. He's driving up with his new wife and their child, the most adorable two-year old ever. Mom doesn't remember the exact term the coroner used; she came away thinking it was some sort of heart disease. I have had slightly high cholesterol for the last few years, never so high that the doctor insisted I start taking something for it, but now I will. The mystery: Liz and Mom usually put both of their names on anything like a bank account or safety deposit box. There's no will in the safety deposit box that Mom's name was also on. But two days before she died, Liz rented another safety deposit box, and Mom's name isn't on it. They can't open it until they have a death certificate. I don't think it's a big mystery. I suspect Liz needed to get Mom's signature to add her to the official owners of the new box. But if I was plotting a story, this would have to be significant. What I really think is it's another example of none of us knowing how much time we have left. It's a bit ironic in the modern sense of the word that I've been complaining about social network services, and then my sister died, and now I'm very grateful for them. With very casual online friends, I always wondered whether to say anything when they posted bad news. Would I sound presumptuous? Now I know the answer. You don't have to say much. A simple "I'm sorry" or "I can't imagine what you're going through" is appreciated. Longer stories are touching too, even from total strangers. Death should tell us that we're all family. My increased appreciation of social networks doesn't affect my resolve to spend less time online, but I won't cut myself off entirely. If ever there's anything anyone thinks I should know, don't hesitate to leave an off-topic comment on a post or write me. I'm "shetterly" at gmail. I think the oddest moment occurred yesterday. I was thinking about my parent's situation now, and this thought blipped through my mind: "Thank God Lizzie's up there to look after them. Oh." I talked to my cousin who has been closest to Mom and Dad, and she agrees that the right thing to do is to follow their wishes about waiting to go up. I called the folks today and got a woman who was cleaning Liz's house. She said Mom and Dad were handling things surprisingly well. I think coping with the immediate problems is an important part of how they're coping with this. I don't envy anyone doing the cleanup. One of the many ways that Liz and I were opposites is she was a packrat. Her flea market was an excuse to indulge that. There are two large tents like quonset huts filled with the sorts of things you find at swap meets--"flea market" is not a euphemism for an antique business. A blunter name for Liz's business would be that she was a junk dealer, but to her, everything was useful, and it was just a matter of waiting until the right person came along for the right thing. Whether Liz's business has negative value, I don't know, but a great deal of her collection will probably end up in a landfill now, because she won't have the thirty years she should've had to find the buyer for every unwanted thing she owned. I don't think anyone's found a will yet. Lizzie lived with cats and dogs. She never married or had children. Alberta law says when people die intestate without spouses or children, everything goes to the parents, and fortunately, Mom and Dad are both able to handle finances, so I'm not worried about that. But I wonder if there's a will, simply because Liz would've had so much fun dividing her possessions. If you don't have a will, find out what happens if you die intestate, then decide if you're comfortable with that. I'm very, very grateful for all the kind thoughts. I won't be able to answer each one individually, but every one touched me. My parents are fiercely independent. I booked a flight to leave tomorrow, but they insist they want a week to deal with things before family comes up, so I canceled it. Which means I'll check in with them each day to see whether I should come up the next, but it's impossible to predict anything. It would be easier to overrule their wishes if they were less capable, but they're both mentally sharp, and I think the same principle applies to parents that applies to kids: it's better to err on the side of respecting them when they say they're capable, even if that's scary. Also, grief—there are no rules that cover everyone.